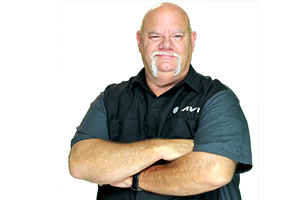 AVI Instructor Ron Bilyeu is a 30 year ASE Master Technician and instructor who has developed and presented over a dozen programs for Automotive Video. Ron was an instructor for Lincoln Automotive College and even owned his own training provider called Pro Auto Tech Training. Ron’s unique approach to understanding automotive systems stems from the ability to view these systems from an engineering level. This in-depth understanding has allowed Ron to master today’s complex automotive technologies in areas like network modules and Gasoline Direct Injection engines. Ron’s teaching prowess comes from his ability to simplify complex systems, help students gain confidence in their skills and keeping his students well engaged. Ron currently resides in Indiana with his wife Priscilla and their cat, Hemi. When Ron is not teaching he likes to tune Hot Rods and attend local car shows with his Corvette.